Art comes in all shapes, sizes and colors - You know it’s good if you can’t stop staring! March 28th … the proceeds go to benefit the children of Le Bonheur. Members of the Memphis Chapter of Philoptochos to promote the charitable benevolent and philanthropic purposes of the Greek Orthodox Archdiocese will once again provide the opportunity for Mid-Southerners to view and purchase a diversity of drawings, paintings, and prints from local and regional artists to benefit the Children of The Annunciation Greek Orthodox Church is located at 573 North Highland. Our women’s philanthropic society will be hosting “Art Suitable for Framing” on March 28th, 2015 from 1 p.m. – 6 p.m. in the Harry and Margaret Cotros Hall. General Admission is $10.00 per person for this year’s charity and social activity of “Art Suitable for Framing”. You will be able to purchase the “It’s Greek To Me!” cookbook, a mélange of traditional recipes from Greece and other countries embracing the Eastern Orthodox Religion. Grecian gourmet hors d’oeuvres will be served for your culinary delight and there will be a cash bar. 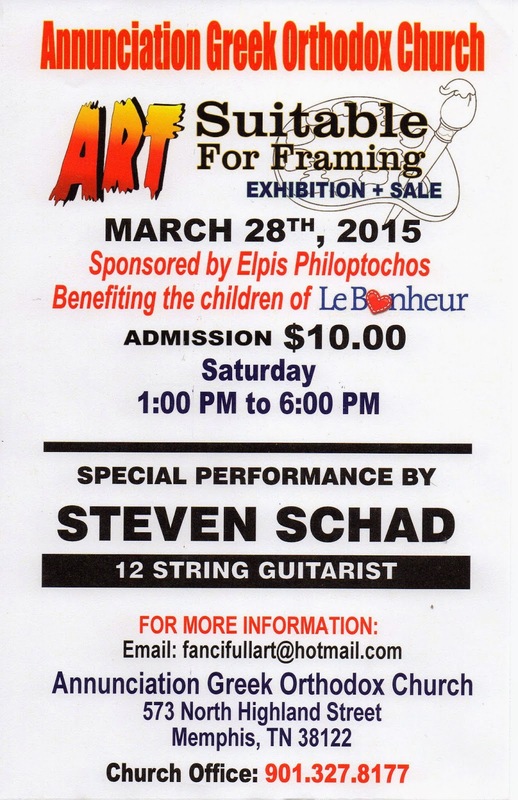 For your entertainment, Steve Schad will give a special performance. He is an exceptionally accomplished guitarist and multi-instrumentalist with a vibrant and imaginative musicality. This year’s art show/sale will feature artist, Matthew Lee, who paints en plein air on location in Greece working in a painterly style in oils. Our art show and sale is to provide a casual atmosphere in which visitors may learn more about local artists, enjoy hor d’oeuvres, entertainment, and fellowship. Each participant will receive one complimentary guest pass. Reception: Saturday, March 28, 2015 from 1:00 to 6:00 p.m.
Exhibitor’s Fee: $25.00 for six to eight works of art depending on size. Sales: There is no commission on sales. Entry Limits: Size of artworks should not exceed the 6ft x 8ft display panel. Requirements: Original artwork or prints will be exhibited for sale at a price determined by the artist. No artwork will be allowed to leave before the exhibition closes unless sold. Artist should also provide all proper displaying materials (wire on back) for hanging your artwork. All artwork must be framed unless gallery wrapped. Identification: Each artwork must have attached separately to the back showing name of Artist, Title of artwork, Medium and Price. from 1:00 to 3:00 p.m. or Monday, March 30, 2015, from 1:00-5:00p.m. My signature implies agreement and conditions as described above. I hereby agree to exhibit and sale my artwork. Please call Peter Melonas at 901.409.4182 with any questions.